Next stop: Mexico. What's the best brunch in LA for morning tongue tacos? No need to go South of the Border, just head west for Fig's Mexican breakfast. This city has endless delicious renditions of huevos rancheros, but you’ll love being surrounded by the Hollywood Regency-meets-country villa décor at this lovely restaurant inside the Fairmont Miramar Hotel in Santa Monica. 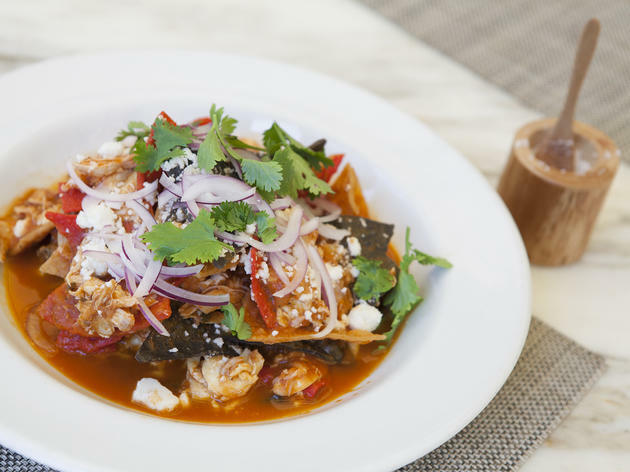 It’s an unexpected setting for a fantastic Mexican breakfast, but Chef Ray Garcia turns out a deeply flavorful platter of chilaquiles ($18)—crispy tortillas mixed with eggs, chicken, a house-made salsa and queso fresco. You could eat while overlooking the pool—which tends more toward vacationing families than bikini beauties—but our favorite spot is the cozy booth tucked right next to the entrance. From there you can watch as Garcia mans the grill on Sundays to turn out meltingly good lengua tacos. Want to toast your culinary cojones? Opt for the Kegs and Eggs special, where $35 will get you an unlimited pouring of craft beer and any brunch item. Salud! Breafast served Mon-Sun 7-11am; Brunch served 11am-2:30pm. 101 Wilshire Blvd, 310-319-3111, www.figsantamonica.com. Honorable mention: Frida Mexican Cuisine in Westwood has a Sunday brunch ($30 for the buffet with $12 bottomless drinks) that pulls out all the stops: aguas frescas and cafe de olla, made-to-order sopes, tacos, quesadillas, omelettes and grilled meats, plus a full line-up of Mexican hot dishes, from tamales to menudo. And yes, there's a chocolate fountain and churros, in case you were wondering.